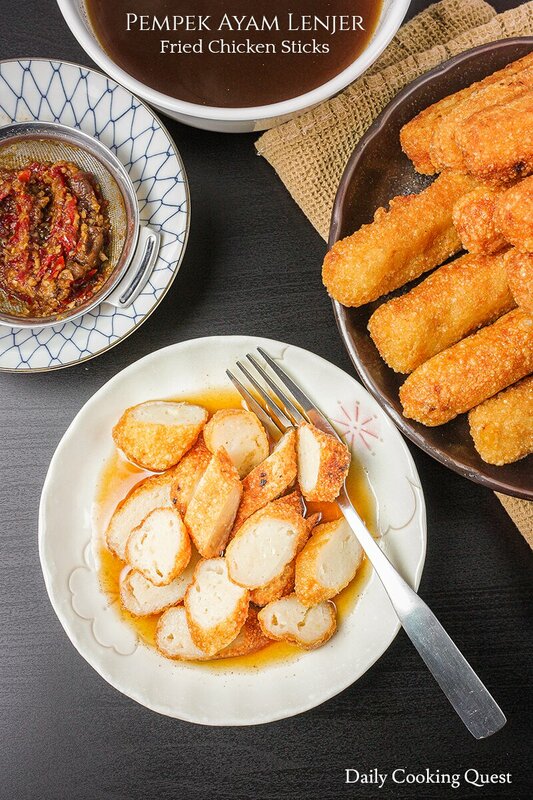 Pempek is Indonesian fish cakes, very similar to Japanese fish cakes. Our pempek is made from a mixture of ground fish and tapioca flour and comes in various shapes. Regardless of their shapes, they are first boiled, then fried, and finally cut into small pieces, and served with saus cuko, a rather thick, spicy, and sweet tamarind sauce. Pempek is primarily made from ikan tenggiri (spanish mackerel). But you can actually make it with other white firm flesh fish too, like cod. 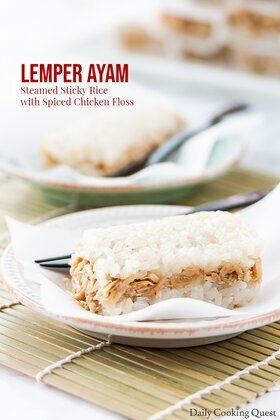 Today I am going to share with you a rather unexpected recipe for pempek ayam lenjer - fried chicken sticks using ground chicken! This ground chicken pempek tastes very similar to Indonesian pempek, and most probably cannot tell they are not made from fish if you don’t reveal the secret. To trick our tastebuds, you will need some anchovy stock and some ground dried shrimps. You can use Korean anchovy dashida, or buy Korean anchovies and ground into powder. The dried shrimps is used in the sauce, but if you don’t want to buy another product, you can also just use the same anchovy stock for the sauce. Another alternative if you don’t have anchovy stock is to use Japanese dashi stock. Your pempek will still come out quite fishy, but personally I prefer the one with anchovy stock. 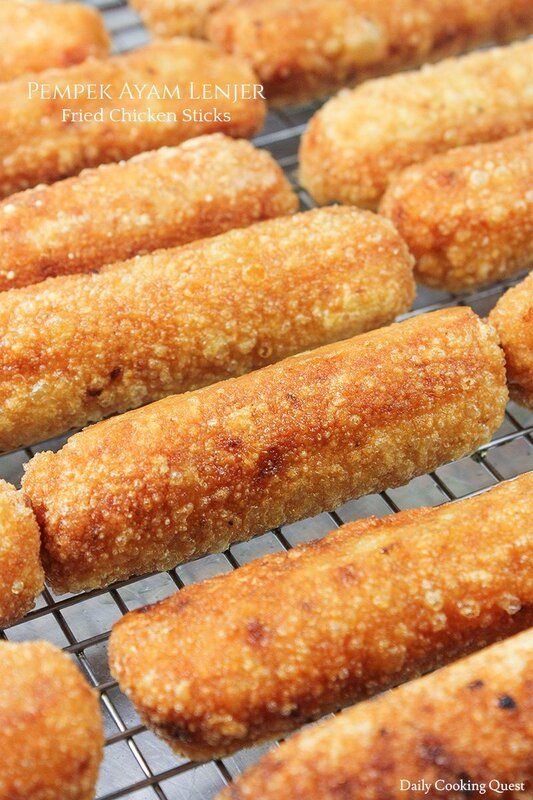 You don't have to fried them all! 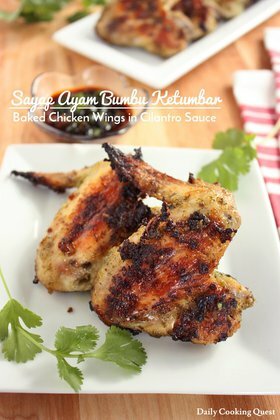 This recipe makes a rather large batch of pempek. If you don’t want to serve them all in one sitting, you can freeze some for future. You need to follow the recipe up to step 5, that is until the boiling step. Once boiled and chilled to room temperature, wrap each log with a saran wrap, then store them in a large freezer bag. 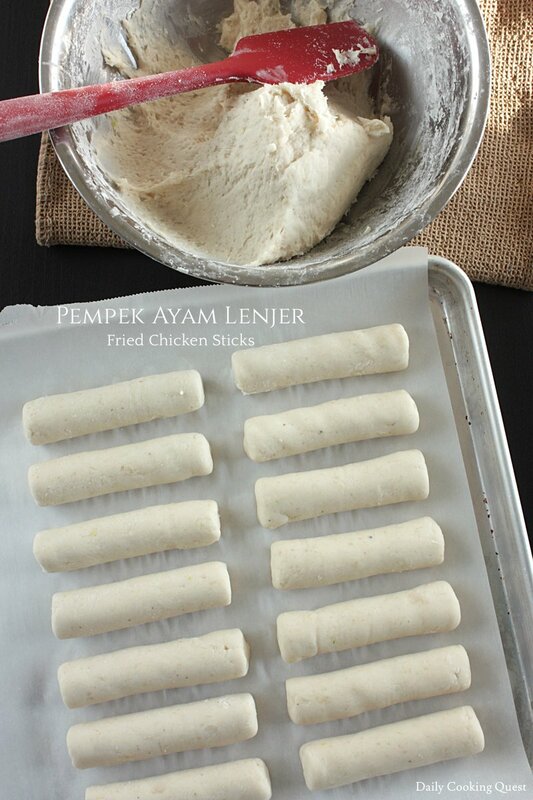 When you want to have some pempek, grab some frozen boiled chicken sticks and let them thaw, then proceed from step 6. Place chicken breast, shallot, garlic, and ice cold water in a food processor. Ground into a smooth paste, then transfer to a large mixing bowl and set aside. In a small sauce pot, boil together water, salt, sugar, anchovy/dashi stock granules, and fish sauce. Add all purpose flour and keep stirring until a thick paste is formed. Turn off heat and set aside to cool to room temperature. Add the thick cooked flour paste to the ground chicken mixture, mix well. Add enough tapioca flour to the mixture, and keep on stirring, and finally kneading with hand into a thick dough. Stop adding tapioca flour once you can scoop a bit of the dough and shape into a small log and it can hold its shape. Divide into equal 24 portions. Shape each into a 1" diameter log. Boil a large pot of water in a soup pot. In batches, gently drop the logs into boiling water and cook until the logs float to the surface. Once they float, continue boiling for another 4 minutes. Remove the cooked logs to a strainer/colander. Repeat for the remaining logs. I usually cook 6 pieces at a time, for a total of 4 batches. Heat 1/2" of oil in a frying pan, fry the boiled chicken logs until golden brown. Set aside over wire rack to remove excess oil. Puree soaked dried red chilies and garlic in a food processor, then transfer to a sauce pot along with the rest of the sauce ingredients. Bring to a boil, then reduce heat to a simmer and cook for 15 minutes. Turn off heat, strain to get a clear sauce. Cut the fried chicken sticks into bite size pieces and place in a bowl. Top with a bit of the spicy tamarind sauce. 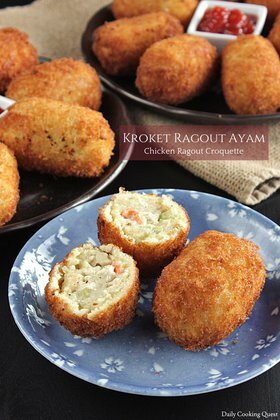 Serve with accompaniments if preferred. Thanks for sharing this recipe Anita. The pempek looks so delicious. I will give this a try soon. You are welcome Tuty :) I hope you will like it. Hi Vicky, thanks for letting me know that part of the recipe instruction is missing! This happened because I recently migrated the site. It is now fixed and the instructions are complete.